(l to r) CT PRIDE members William Urich and Kalisa* with Attorneys Marisa DeFranco and Amy Grunder moments after Kalisa was granted US asylum. Recently I traveled to the JFK Federal Building in Boston to appear as a witness on behalf of Kalisa*, who works with Connecticut PRIDE. Kalisa, a Ugandan citizen, petitioned for a stay of deportation and had requested US asylum. For some time now, I have been working with Kalisa's attorney, Marisa DeFranco, to keep the US government from sending Kalisaback to Uganda. We all know what happens there. Kalisa's case is unique in that he is not only gay, but is also hearing impaired since the age of 10 when an incorrect treatment for malaria in his village in Uganda left him deaf. There are no protections or accommodations for people with disabilities in Uganda. That fact, complicated by his homosexuality, would surely have made Kalisa another sad statistic if he were to be sent back. Because of Attorney DeFranco's constant, diligent vigilance and amazingly thorough work over the past year and a half, it gives me an extreme pleasure to announce that Kalisa has been granted asylum by the United States government and is no longer faced with the threat of deportation back to his native Uganda. I should also add that the hundreds of hours of Attorney DeFranco's superior work were completely pro bono.We at Connecticut PRIDE are deeply grateful for her dedication and hard work and share a huge sigh of relief with Kalisa. *Not his real name. 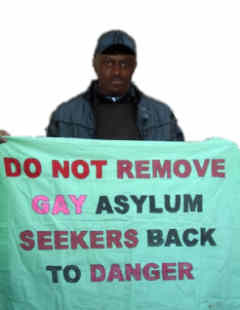 Kalisa asked to use a pseudonym because he fears for the safety of his family in Uganda if his real identity is used. Well done all! Well done! Reading this has made me so happy. Just so happy.